The last stage of toilet training is staying dry at night. To stay dry at night, your child's brain and bladder must work together so your child wakes up to go to the bathroom. Some children develop this ability later than others. Bedwetting is very common. Millions of children in the United States wet the bed at night. Some children still wet the bed at age 7, or even older. Although the problem usually goes away over time, many children, and even a small number of adults, continue to have bedwetting episodes. Bedwetting also runs in families. Parents who wet the bed as children are more likely to have children who wet the bed. There are 2 types of bedwetting. Primary enuresis. Children who have never been consistently dry at night. This most often occurs when the body makes more urine overnight than the bladder can hold, and the child does not wake up when the bladder is full. The child's brain has not learned to respond to the signal that the bladder is full. It is not the child's or the parent's fault. This is the most common reason for bedwetting. Secondary enuresis. Children who were dry for at least 6 months, but started bedwetting again. There are many reasons that children wet the bed after being fully toilet trained. It might be physical, emotional, or just a change in sleep. This is less common, but still not the fault of the child or parent. Remember that your child has no control over bedwetting. So, try to be patient. Your child also may feel embarrassed and ashamed about it, so tell your child that many children wet the bed. Let your child know you want to help. Above all, do not punish your child or ignore the problem. Neither approach will help. Take these steps to help your child overcome bedwetting. Help your child understand not to hold urine for a long time. Make sure your child goes to the bathroom at normal times during the day and evening. Be sure your child goes to the bathroom before going to sleep. It is OK to reduce the amount of fluid your child drinks a few hours before bedtime. Just do not overdo it. You might also try using a bedwetting alarm. These alarms are small and easy to buy without a prescription. The alarms work by waking children when they start to urinate. Then they can get up and use the bathroom. Bedwetting alarms work best if you use them every night. Alarm training can take several months to work properly. Once your child is dry for 3 weeks, continue using the alarm for another 2 weeks. Then stop. You may need to train your child more than once. Always notify your child's health care provider of any bedwetting episodes. A child should have a physical exam and a urine test to rule out urinary tract infection or other causes. Contact your child's provider right away if your child is having pain with urination, fever, or blood in the urine. These may be signs of an infection that will need treatment. 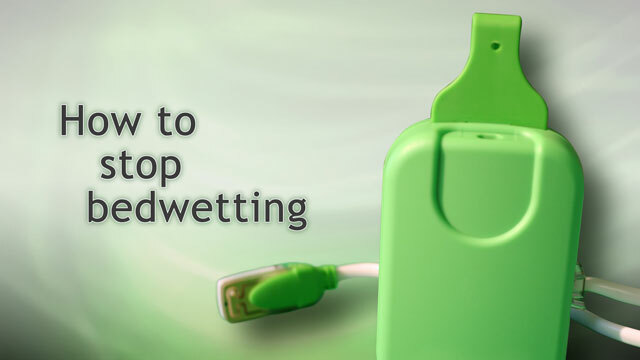 If your child was dry for 6 months, then started bedwetting again. The provider will look for the cause of the bedwetting before recommending treatment. If you have tried self-care at home and your child is still wetting the bed. Your child's doctor may prescribe a medicine called DDAVP (desmopressin) to treat bedwetting. It will decrease the amount of urine produced at night. It can be prescribed short-term for sleepovers, or used long-term for months. Some parents find that bedwetting alarms combined with medicine work best. Your child's provider will work with you to find the right solution for you and your child. Capdevilia OS. Sleep related enuresis. In: Sheldon SH, Ferber R, Krygger MH, Gozal D, eds. Principles and Practice of Pediatric Sleep Medicine. 2nd ed. Philadelphia, PA: Elsevier Saunders; 2014:chap 13. Elder JS. Enuresis and voiding dysfunction. In: Kliegman RM, Stanton BF, St. Geme JW, Schor NF, eds. Nelson Textbook of Pediatrics. 20th ed. Philadelphia, PA: Elsevier; 2016:chap 543. Leung AKC. Nocturnal enuresis. In: Kellerman RD, Bope ET, eds. Conn's Current Therapy 2018. Philadelphia, PA: Elsevier; 2018:1189-1192.